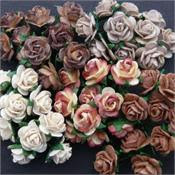 "Okayyyyyy, Inquiring minds would like to know, howwwwww did you make those flowers"
I buy my mulberry flowers from Wild Orchid Crafts A personal choice I know but I like to buy all mine in white and then I just colour them with Glimmer mist depending on what I am working with at the time, like I said a personal choice. But Wild orchard crafts has plenty of choice. and I can change to whatever I want them to be! Leaf`s are prima. 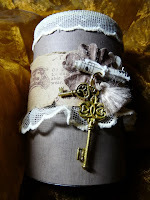 with tim holtz ink. timepiece something I had laying around but re inked. This is going into the challenge over at cropstop The Challenge is "time"